How can I sort my keyword search results? By default, Casetext sorts your keyword search results by relevance. 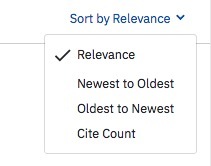 You can also sort your results by date (newest to oldest and oldest to newest) as well as by cite count.